It was below freezing, winds over 20 mph, and I decided to take a drive to the beach. Something just pulled me there. If you find yourself in Michigan in the winter it's worth it to drive to the shores of Lake Huron (by Port Huron, we're on the East Side of the state) and check out the beach. You never know what you'll find. Open water, flat ice, old snow and sand mixed together, frozen pieces floating down with the current, little ice caves, or huge "icebergs" from where the waves just keep crashing up on shore, freezing into these huge mounds. Every year is different and unique. Our version of icebergs and icecaps are what I found that day. The little video above shows you what I stumbled upon. I parked my jeep and headed towards the beach. The wind hitting my face was more than cold, it was almost as if it was forcing me to close my eyes while it slapped me across the face. I could see the wind also making huge waves that were hitting the ice so hard they were flying up over the tops of them, at least 15+ feet in the air. I knew I didn't want to stay long, but I knew I HAD to come back. You can't see natural beauty like that and let it go unnoticed. A few days later my assistants and I piled back in the jeep and headed back to the beach. With all my camera gear strapped to my back the girls also had an overwhelming amount a fur. We decided we wanted to all be wearing vintage fur coats for the shoot. Less than 2 minutes there we start exploring the area and Taylor falls in. One wrong step and she's up to her knee in water. She's done for. One thing you should know about the frozen shores of our beaches- they are unpredictable. They might look like they've been frozen for months but mother nature can cause miracles overnight. Taylor takes off to warm her toes and Elores and I stay out to get a few shots. 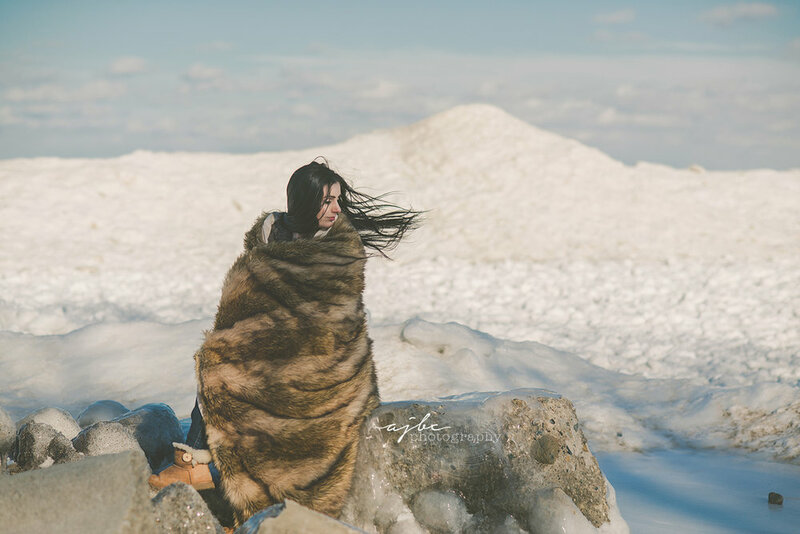 This glamorous vision of expensive fur coats in front of this ice quickly turned to something more organic, more native, almost tribal. Elores started to take on this wild, mountain woman feel and we just ran with that. Take a look. We did swap places for a second, Elores getting some shots of me (that I edited back in the studio later) before we ran back to the Jeep. I ripped off my coats (yes it was so cold I was wearing 2) down to my tank and wrapped myself up in the blanket, which was actually incredibly warm, and I just lived in that moment, in the sunshine and cool air, while she snapped a few photos. 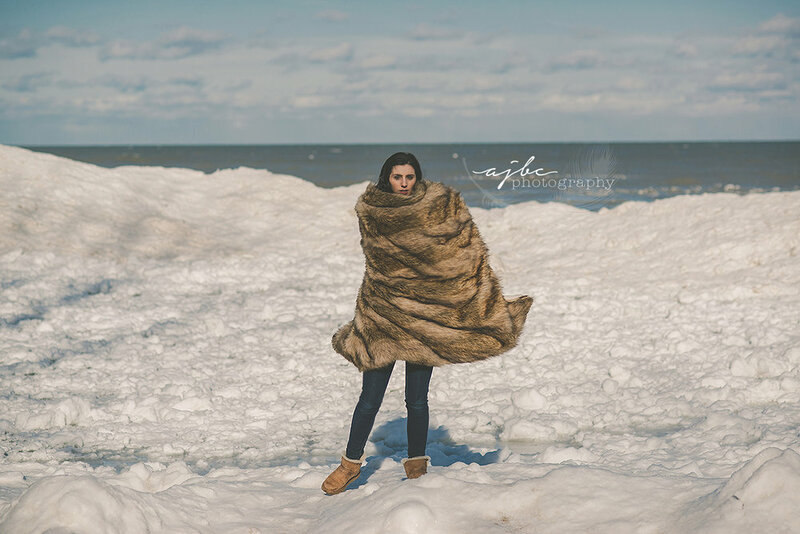 If you like this winter feel, check out Taylor's Winter Beauty Session! 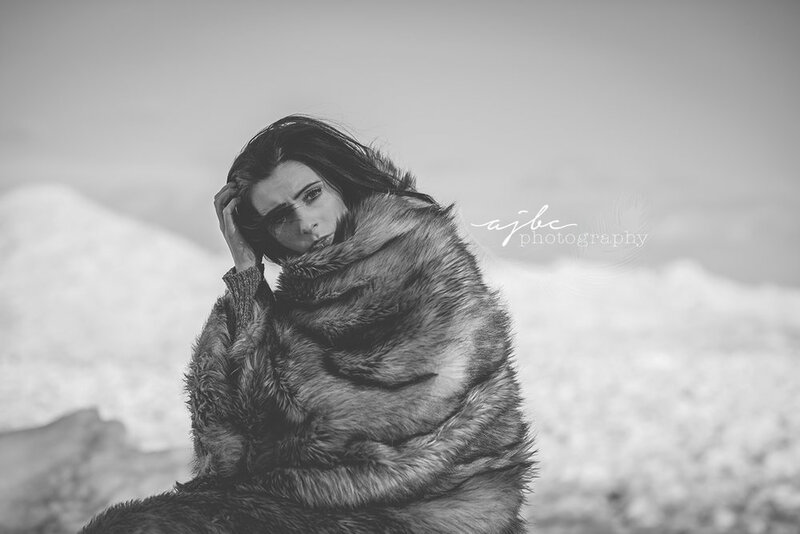 For another gorgeous shoot in the snow check out Aubrey's Senior Shoot!